A throwback video-game system is the popular gift this holiday season. But it’s unclear whether the Nintendo NES Classic Edition will be available in Vancouver for Christmas, after the console flew off store shelves within minutes of being launched Nov. 11. 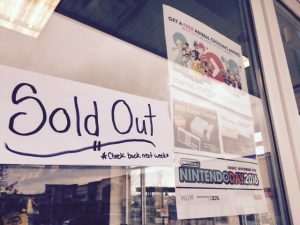 EB Games in South Surrey sold out of the NES Classic. The original NES was released in 1985 and kick-started a new generation of gaming consoles, making Super Mario Bros., Donkey Kong, and The Legend of Zelda household names. In the NES Classic Edition, 30 games come built-in within a miniature console. It is compatible for today’s TVs but also has an optional setting that recreates scan lines on screen to mimic the look of the ’80s and ’90s. “It’s a huge deal for Gen-Xers. It’s nostalgic,” says Jay Catterson, a gamer since age five who was 17th in line at a Walmart in North Vancouver on launch day. The store had 18 units. He was one of the lucky ones while many customers were left upset. Drobot handed out golden tickets to her customers who stood in line as early as 5 a.m. She recalls someone had offered $200 to those in the front of the line. No one took the offer. Disappointed retro-gamers vented on Twitter minutes after the NES Classic launched on Nov. 11, 2016. Retailing at $79.99, the NES Classic is an affordable gift. But many are shaking their heads as scalpers are selling the product on resale sites in the range of $450. The highest price was $2,450 posted on E-Bay less than a week after the launch. Some say that’s a waste of money. “Go buy your 4K TV and PS4 Pro if you’re going to throw that kind of money around!” said Catterson. The Sony PS4 Pro launched a day earlier than the NES Classic. Retailing at $499.99, it’s more advanced than the retro Nintendo console. It remains widely available. 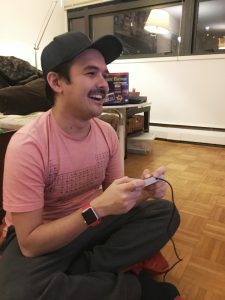 Jay Catterson, a 30-something gamer, feels like a kid again. Nintendo’s Twitter page states the company is “working hard to keep up with consumer demand. There will be a steady flow of additional systems through the holiday shopping season and into the new year.” Nintendo’s PR firm, Golin, would not comment any further.